We’ve just recently had the opportunity to download and play the brilliant Assassin’s Creed Syndicate, Dead Space 2 and The Witness for absolutely nothing, all made possible thanks to the awesomeness of the Xbox Games With Gold scheme for April 2018. But now the month has come to an end and May is here, bringing with it four more free titles for Xbox One and Xbox 360 gamers to enjoy. The question is, are they actually any good? We take a little look. It’s always good to see a game debuting on Xbox One as a free Games With Gold title, and after the enjoyment found in the original Super Mega Baseball, this one comes hotly anticipated. Although it’s been pushed back from its original 2017 launch by a good few months, signs are good as baseball goes super mega again, with the sequel to the fun home-runner promising a more grown-up feel, gorgeous new visuals, deep team and league customisation, and, most excitedly, the long-awaited online multiplayer modes. We obviously won’t know exactly how good it is until a few days after its release and we’ve had the chance to go hands-on with it properly, but with an overhauled presentation scheme, refined physics, some lovely Xbox One X enhancements and the ability to play cross-platform with the PC boys and girls, signs are looking good for Super Mega Baseball 2. If you’re looking for a game that will keep you busy for many days, weeks, months and quite possibly years, then Metal Gear Solid V: The Phantom Pain is it. In fact, even if you aren’t looking for a game that has superb long term draw, then just get your download in and ‘play’ through the first couple of hours. It’s absolutely stunning, full of scene setting and dropping in a whole ton of utterly brilliant cinematics. It may not feel like a game to begin with, but that’s not a bad thing and once you do get to take control proper, you’ll still find something that is hugely appealing. Creating weapons, messing around with Fulton Recovery Systems, sniping enemies from afar, debating the odd interrogation and just standing in awe at the wonderful world that Konami have created with MGS are all par for the course, and all ensure that this is one game that is as much an ‘instant download’ as anything before, or quite possibly after, it. Chances are, those first few hours will drag you in to the MGS world once more too, refusing to let you move away until you’ve taken in everything that it can deliver. It is that good. If you’re after retro, then the Sega Vintage Collection will bring it. But that in turn immediately sees Streets of Rage only really appealing to a certain section of Xbox 360 and Xbox One gamers, as the chance to jump into the boots of Axel, Blaze and their friends, fighting against Mr X will probably be something the more modern gamer will dismiss out of hand. Should you wish to give it a shot though, you’ll probably be quite taken by what it delivers… if only because this brawler will probably have enough of a draw to keep you going back for a few weeks. After that? Well, even the inclusion of local and online co-op will probably struggle to see you playing it long term, ensuring that Streets of Rage turns out to be the black sheep of the GWG May titles. It ain’t a bad black sheep though. You may think that you’ve played enough sci-fi shooters, and have spent more than enough time dodging bullets to even worry about downloading a game that is getting on for 7 years old. But if you haven’t played Vanquish, then you’re seriously missing out. A shooter that tore up the rule book when it arrived on Xbox 360, you can now experience the frenetic gameplay and enjoy the unique moves it brings for free… all thanks to the Xbox Games With Gold scheme. With Vanquish also fully playable on Xbox One due to the brilliant Xbox Backwards Compatible program, should you have missed out all those years ago, but are looking for something that is still up there with the decent shooter of this world, then Vanquish deserves a download. Hell, it deserves more than just a download. It deserves much of your time. Make sure you give it the respect it deserves then will ya? 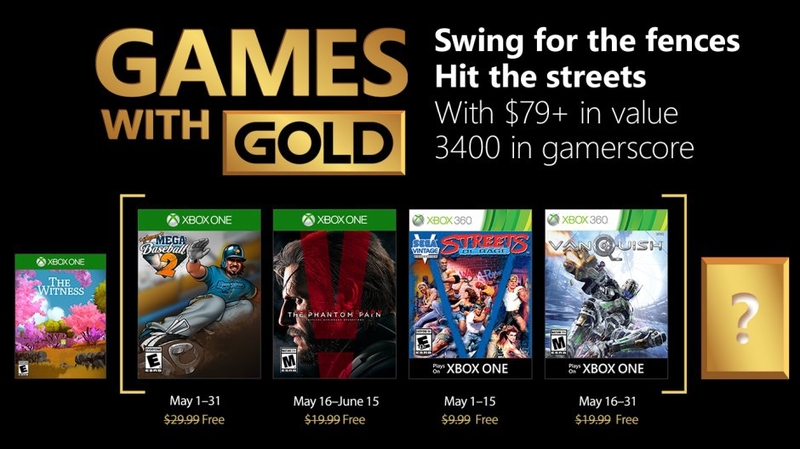 As a month of free games, May 2018 isn’t a bad one at all, and thankfully, those still gaming on Xbox 360 will be able to at least find some enjoyment in one of their games this month, as once Streets of Rage has punched itself into oblivion, the rather brilliant Vanquish will rock up with its price tag removed. So, are the free games being given away throughout May as good as the stunning offerings found in April? Well, you know what? It’s very very close but with the slightly unknown quality of Super Mega Baseball 2, and then the retro goodness of Streets Of Rage kicking the month off, it’s only really when we manage to squeeze through to the hump will we get to check out the properly good games. But then, when we do… expect to be wowed by the Games With Gold titles for May 2018. It’s another great month to be an Xbox gamer!